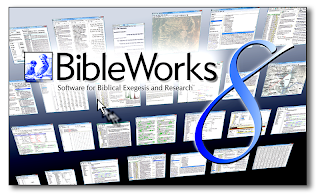 I have been a BibleWorks user since my Bible college days (BibleWorks 3?). But I haven’t upgraded my version (BibleWorks 5) in several years. One reason for not upgrading is that I have been fairly content with BibleWorks 5 (BW5) and my add-on modules of BDAG and HALOT. But, I ran into a friend of mine at this year’s Society of Biblical Literature meeting and he convinced me that BibleWorks 8 (BW8) was a significant improvement from the version I was using. So after talking with Jim Barr, director marketing at Bibleworks, I agreed to review this new version. Here are my initial thoughts. Loading the program meant removing the older version and then loading BW8). I had some initial difficulties, some of which were on my end of things, but customer support was able to get me up and going. After loading the program I followed the recommendation to watch the introductory videos on the search window, the browse window, the analysis window, and the BibleWorks editor. These videos were very helpful in getting started. Although I have not had a great deal of time to play around with BW8 my initial impression is that it is a significant upgrade from BW5. Not only are there more language resources available, but the analysis window really allows you to see more information at a glance than ever before. Stay tuned for future posts.